Fontainebleau today reinvents the original vision of legendary architect Morris Lapidus – a stage where everyone plays their unique part. At Fontainebleau, striking design, contemporary art, music, fashion and technology merge into a vibrant new kind of guest experience. Guests are invited to enter a world of endless possibilities, where they are free to play, shop, dine, spa, meet or simply relax – however they define a perfect day. Situated on oceanfront Collins Avenue in the heart of Millionaire’s Row, Fontainebleau Miami Beach is one of the most historically and architecturally significant hotels on Miami Beach. Opened in 1954 and designed by Morris Lapidus, it was the most luxurious hotel on Miami Beach, and is thought to be the most significant building of Lapidus’ career. 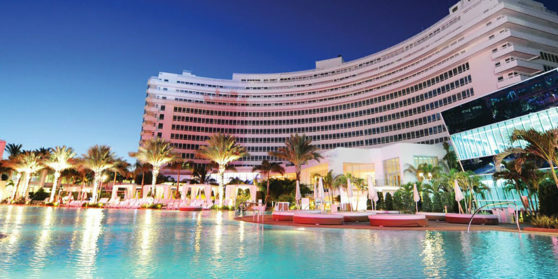 In 2012, American Institute of Architects granted Fontainebleau the award for the Top Building in Florida, after more than 2.4 million votes cast in the “100 Years. 100 Places.” competition. A landmark since its debut in 1954, Fontainebleau has been restored and transformed by a team of renowned architects and designers to create one of the world’s most dynamic destination resorts. In 2008, following a $1 billion reinvention, Fontainebleau Miami Beach reopened with an A-list celebrity-attended grand opening bash featuring the Victoria Secret Fashion Show and performances by Usher, Mariah Carey and Robin Thicke. 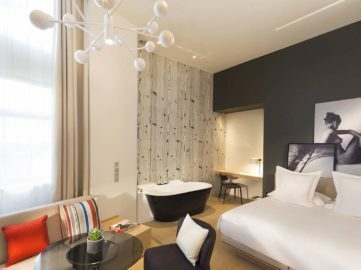 A total of 1,504 guestrooms offer luxurious comfort and amenities, from deluxe guestrooms and three bedroom suites, to breathtaking penthouses. The 20-acres oceanfront hotel features an expansive poolscape, a pristine Atlantic Ocean beach, state-of-the-art conference and event facilities, one chic nightlife venue, including LIV, the ultra-exclusive and high-energy nightclub, home to celebrities and VIPS, and the 40,000-square-foot Lapis spa. At the direction of culinary celebrities from around the globe, Fontainebleau offers 12 fine dining and casual restaurants, bars and lounges. Signature dining experiences include Scarpetta by Scott Conant, the James Beard award recipient who has created a regional Italian menu combining the simplicity of Italy’s cucina rustica with the refined flavors of fine cuisine; Hakkasan, globally recognized as the pioneering concept that single-handedly changed the face of Chinese cuisine; and Michael Mina 74, the newest concept in partnership with award-winning chef and restauranteur Michael Mina, offers a high energy American Bistro-Lounge with globally inspired classics with a twist.